Lance Armstrong, George Hincapie, Christian Vande Velde, and Dylan Casey complete third in the 24 Hours in the Old Pueblo mountain bike race. 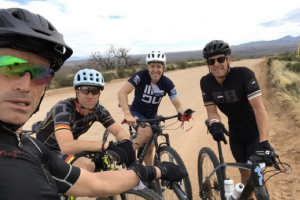 Lance Armstrong, George Hincapie, Christian Vandevelde, and Dylan Casey came in third as they were reunited for 24 hour mountain bike race in Arizona. Armstrong and his old US Postal teammates took part in an endurance mountain bike race in Arizona – 24 Hours in the Old Pueblo. George Hincapie, Christian Vande Velde, and Dylan Casey joined Armstrong in the relay event in Tucson, Arizona. Lance Armstrong is still banned from racing. However, because this race is not a UCI-sanctioned event the disgraced professional was not barred from participating in the race. Former Armstrong teammates Hincapie and Vande Velde also served doping suspensions. These suspensions were handed down following US Anti-Doping investigation into doping at the US Postal team. Armstrong and his three teammates were only a few of the 1,800 riders that participated in the event. This year’s race was the 18th Old Pueblo race in Tuscon. Via http://www.cyclingweekly.co.uk/news/latest-news/lance-armstrong-former-us-postal-team-mates-finish-third-reunite-race-312548 For cool tips on bike repairs, Bicycleshoponline Repairs is a good resource to check out. Check out BicycleshopOnline for merchandise information on mountain bikes, hybrid bikes, electric bikes along along with all types of bicycle parts and accessories. While there, explore huge online deals on all sorts of bicycles from some of the top online retailers.